Hong Kong, 11 July 2014 - Established in 2002, PacHosting continuously strives to provide clients with quality hosting and server solutions. Throughout the years, PacHosting has gained support from thousands of valued clients from all walks of life. 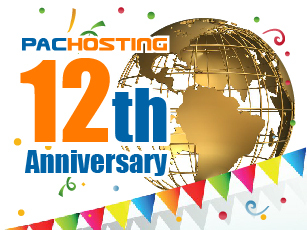 To celebrate the 12th anniversary on 10 July 2014, PacHosting launched a special free international bandwidth upgrade. This current promotion is applicable to Cloud Servers new business clients. Clients subscribing Cloud Servers P180, P280 and P380 are entitled to free 10Mbps Dedicated International Bandwidth, while clients subscribing Cloud Servers P480 and P580 are entitled to free 20Mbps Dedicated International Bandwidth.